Hello and welcome to the PoliticsHome PMQs liveblog, serving all your political needs over the next hour or more. Stay tuned for minute-by-minute coverage, including all the best tweets and full quotes of the vital exchanges. 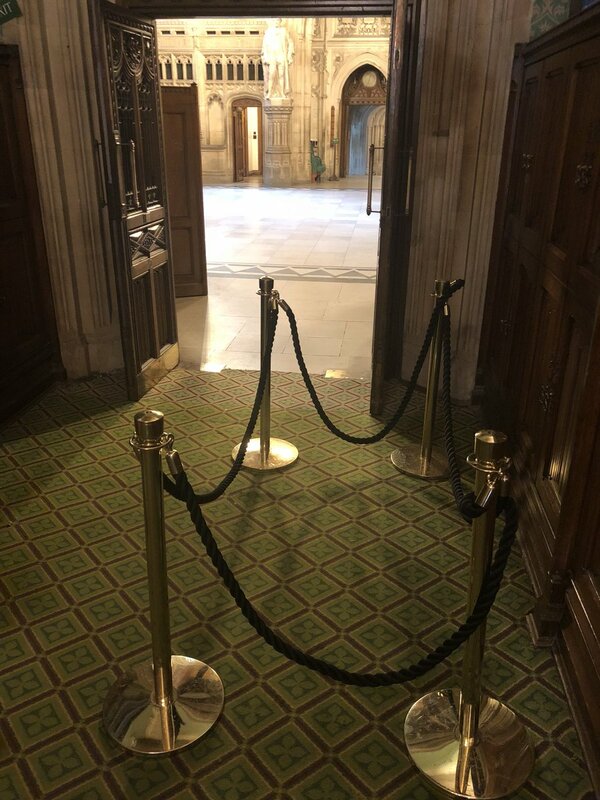 Over the next half hour I'll be noting down what I think is most likely to come up, but in the meantime here's the list of MPs waiting to needle the PM. WHAT MIGHT JEREMY CORBYN ASK THERESA MAY ABOUT????? That was the zinger opening to PMQs last week as Jeremy Corbyn tried for the second time in a row to take the PM to task over Brexit. Sadly the rest of the exchange did not live up to the stellar opening - which took Theresa May aback and had the House howling with laughter - but could the Labour leader try for the Brexit hat-trick? There is certainly the ammunition to do so, should he choose to. As if by design Michael Gove launched an astonishing public attack on Philip Hammond this morning - claiming that the tight-fisted Chancellor is stunting his hopes for a powerful new environmental regulator after Brexit. Jeremy Corbyn seems only recently to have woken up to the fact he can use Cabinet rows to his advantage - and everything is in place for another of those open goals today. Will he miss as he so often does? Meanwhile there is ample fodder from the Tory backbenches to quote back at the PM. Yesterday ERG boss Jacob Rees-Mogg said Theresa May administration had been "weak" in preparing for Brexit and questioned whether she really wanted to leave the EU. He was joined today by fellow Tory Daniel Kawczynski who said the PM could "destabilise" the party "like you've never seen before" if she fudges Brexit. And yesterday afternoon Westminster watchers were treated to the very painful moment when Immigration Minister Caroline Nokes was forced to admit she had not read the Good Friday Agreement. And Bank of England governor Mark Carney told the world yesterday that British households are now £900 worse off than was predicted two years ago as a result of Brexit. The Labour argument would naturally be that staying in a customs union etc etc etc would mitigate further blows. On the Brexit front Corbyn has multiple angles to play with. For her part the PM can highlight the continual splits on the issue in the Labour party. Key in recent days has been the PolHome revelation that shadow frontbencher Preet Gill tweeted in support of a second referendum, and the party nominated a by-election candidate in Lewisham East who wants to keep the UK in the single market and customs union. WHAT ELSE MIGHT JEREMY CORBYN ASK THERESA MAY ABOUT? On a related note the Tories continue to struggle with the tough topic of migration. As if on a mission to hand ammo to the Labour leader yesterday, Rees-Mogg also took a machine gun to the immigration system, in particular hitting out at the "idiotic" 100,000-a-year migration target. Scottish Tory leader Ruth Davidson meanwhile said the target should be reviewed and students removed from it - directly contradicting the stance of the Prime Minister. Meanwhile PoliticsHome broke the story this week of Hamza Idris - the ex-Carillion worker who has been forced to re-apply for his visa in the wake of the firm's collapse. The saga is just the kind of personal plight at the hands of Government bureaucracy the Labour leader likes to hone in on. ANYTHING ELSE JEREMY CORBYN MIGHT ASK THERESA MAY ABOUT? Sajid Javid is trying to re-set the Tory relationship with the police in a bid to convince them he is on their side. Labour sent out a big briefing note about police cuts - so now could be a good time for Corbyn to hammer that one again. Can we expect a joke about Boris Johnson's call for his own Brexit plane? A politically savvy Labour leader would not pass up the chance. Or might we see May teased about Scottish Conservative leader Ruth Davidson's swipe at 'dour' and 'joyless' Tories? The PM starts by paying tribute to the victims of the Grenfell Tower inquiry and the Manchester terror attack. She says: "That night saw the worst of humanity but also the best"
Labour MP Kerry McCarthy echoes the tributes and congratulates the royal couple. She asks about childhood obesity, demanding a harder line on junk food suppliers and targets. The PM says the royal wedding was a "perfect day". She says the UK has the most stringent targets than the rest of the world and the tax on sugary drinks comes amid a whole package of measures. Tory MP Nigel Huddleston also asks about Grenfell - after the official inquiry began. He wants the PM to confirm the Government will ban flammable cladding, after a report by Dame Judith Hackitt did not recommend doing so. The PM says the Government is "minded to go further" including bans, and will look into the legality of it. The Labour leader says more must be done to see justice done on Grenfell and also pays tribute to the victims of the Manchester attack. He asks how much of the NHS has been outsourced to private companies - a curve-ball! "It is almost a year since the Grenfell tragedy and sadly justice has not yet been done. Many of those families have still not been rehoused and many are still living in tower blocks where they’re worried around the country of the safety of the cladding. More needs to be done more quickly. "I agree with the PM said about the anniversary of the Manchester bomb. We were there are the service yesterday and I pay tribute to the people of Manchester for the fantastic event they held last night in Albert Square which brought all communities across Manchester together. That’s the answer to terrorism, that’s the answer to threats - bring people together. Mr Speaker in 2010 £4bn of NHS services were outsourced to private companies. How much is it today?" "Well can I first of all say to the RT Hon Gentleman that I echo his comments. The terrorists who attacked in Manchester but also sadly we saw a number of other terrorist attacks in this country last year. They were trying to divide us. I think the response of all communities, be it here in London or in Manchester has shown that we will not be divided by the terrorists. We will not let the terrorists win and we will defeat them. "Can I say to the Rt Hon Gentleman that he asks about the outsourcing of services with the National Health Service. Of course what we do know is that spend on the independent sector nearly doubled in the last four years of a Labour government." Corbyn says the involvement of private contractors is up 100% since 2010, says it's “jackpot time” for private firms, and asks if it has put patients at risk of harm. "Mr Speaker my question was about the amount spent now. NHS budgets have increased by just 1% per year under this government. But it’s jackpot time for the privateers. Their share is up by 100% by to over £9bn per year. And we learnt that Surrey NHS has just paid Virgin Healthcare £1.5m not for any service they delivered, but because their bid wasn’t chosen. £1.5m wasted on Virgin Healthcare that should have been spent on healthcare itself. "Is the Prime Minister concerned that this week the National Audit Office said NHS England’s handling of private contractors had ‘put patients at risk of serious harm’?" The PM makes the classic argument that it has gone up more in Wales in the past year. "On the National audit office report what they said was that ‘no actual harm has been identified’. It is also the case that in relation to the particular contracts they were talking about, the savings that have been made have all been reinvested in frontline NHS patient care and have helped to fund the equivalent of an extra 30,000 operations. But he talks about the percentage of money that has been spent on the private sector. I have to say that in England the proportion of spend on the NHS in England outsourced to the private sector did not go up at all. There was somewhere it went up 0.8%. Ah yes - Wales." The Labour leader blasts a Capita contract which the NAO said had put patients in harm's way, over breast cancer screening and GP records. He says it shows evidence of the Government "tearing up the founding principles of the NHS" and putting private profit first. "Mr Speaker - the National Audit Office criticised NHS England's Capita contract saying, and I quote, it had put patients at risk of serious harm. Thousands of women dropped from the national cervical cancer screening programmes. "Another element of the contract handed over to Capita was for GPs' services, which resulted in two-thirds of GP practices receiving incorrect medical records. Five hundred thousand new patient letters left unsent. Isn't this the inevitable consequence of this government tearing up the founding principles of the NHS and putting private profit before public service?" The PM says Labour always "scaremongers" about the NHS while the Tories have protected it. "At every general election since the NHS was formed the Labour party has scaremongered about the Conservative approach to the NHS. They have made, at every general election, they've made claims about privatisation. They've made claims about funding cuts. And what has every elected Conservative government done? "We have protected the NHS. We have protected the NHS, we have impvoed the NHS services, we have put more funding into the NHS and we have ensured that we remain true to the founding principle of the NHS - that it is free at the point of delivery." Corbyn says her comments are "a bit rich" as the Tories opposed the NHS in the first place. Speaker John Bercow has to cut in and quell the noise as MPs are getting a little excited. Corbyn again blasts Capita for its failures in the health service. He turns to GPs, saying one in ten have retired early in the last 10 years. He wants to know how many more GPs there are. "The Royal College of GPs says, and I quote: 'The long list of failures made by Capita have been incredibly frustrating for GPs and our teams. We are still dealing with the fallout. It's public servants bearing the brunt of private failure'. "Mr Speaker, GPs are leaving the profession in despair. 4,000 have retired early in the past five years - that's one in ten. In 2015 the Health Secretary said he would hire another 5,000 GPs. How many more GPs are there than there were in 2015?" The PM says there are more than 14,000 more doctors (not just GPs) in the NHS since 2010. She says Shadow Heath Secretary Jon Ashworth has pledged to continue buying from the private sector when required. "We now have over 14,900 more doctors in our NHS than in 2010. And we are indeed committed to delivering 5,000 more GPs and we've increased the number of training for GPs. But can I also say to the Rt Hon Gentleman - he talks about this issue of the private sector being used in the National Health Service. Well, he might actually ask the Shadow Health Secretary what his view is on this? "Because the Shadow Health Secretary has said: 'We're still going to buy from the private sector where we haven't got capacity in the NHS'. His Shadow Health Secretary is committed to it." Jeremy Corbyn stands up for his man by saying Ashworth will always put patients first. He says people write to him every week saying how hard it is to get a GP appointment. The House goes silent as he reads out a letter for Anne who is struggling to look after her mum who lives in a nursing home. She argues care in substandard. "The Shadow Health Secretary has a very good understanding of the needs of patients and will always put them first. He will not be the one who's putting the private sector first. "The reality is there are 1,000 fewer GPs and the number is falling. No wonder that more and more people are writing to me every week saying how difficult to get a GP appointment. GPs are the bedrock of the NHS. We need more of them. Mr Speaker - I had a letter this week from Anne. She is somebody who is retired and until recently had been caring for her mother at home. And she wrote: ‘The NHS pay a ,private nursing home for mum’s care. Day after day we experience a catalogue of disasters. I can’t leave my mum knowing that her needs aren’t catered for, so I spend hours at the nursing home.’"
What action is the Government taking to deal with the substandard care provider gives in the private care sector which is so upsetting for so many people? The PM says people want confidence to know the care their loved ones get is good quality, and she says the Government is looking into quality of care. She again hits out at Jon Ashworth as the Shadow Health Secretary makes a confused face. "I say to the Rt Hon Gentleman and to Anne that I fully understand that people want to ensure and want to have the confidence and the reassurance of knowing that the care that their loved ones is receiving is of a good quality. That it is why it is this government that has put into place the various steps to ensure that we are looking into the quality of care that is provided in those sectors. "But he talks about the Shadow Health Secretary recognising the needs of patients - I think he was saying he recognised the needs of patients and that’s why the private sector would be used in some cases. But I can just also say to him that the former health minister, now the mayor for Manchester, said ‘the private sector puts its capacity into the NHS for the benefit of NHS patients’ - which I think most people in this country would celebrate." The House seems to have been subdued by the letter from Anne. As the leaders grapple at PMQs the eye is caught by an animated discussion going on between Julian Lewis and James Duddridge, one Bercow’s best Tory friend, the other the Speaker’s biggest critic. Trying to work out a truce? Corbyn again stands up for Ashworth before quoting the CQC which said private providers were offering substandard elderly care. The Labour leader goes for a list of tough stats for the NHS, as he launches his shout-y Facebook rant and demands more cash for the health service. "The Shadow Health Secretary is dedicated to the NHS, not to handing it over to private contractors. That’s the difference. "Mr Speaker the Care Quality Commission said last year there is too much poor care. A fifth of care providers require improvement. Year after year private sector care providers are letting down our elderly. "This year, Mr Speaker, is the seventieth birthday of the National Health Service. I pay tribute to all its staff over all of those 70 years. But the NHS reaches this milestone with the worst A&E waits on record, the worst delays for cancer referrals on record, falling numbers of GPs, falling numbers of nurses and the longest funding squeeze in its history, while this government opens the door to even more profiteering." Why doesn’t the PM act now to end the syphoning off of billions of pounds from patient care and give it to the NHS - the funding that it needs? The PM says the Government will come forward with a long-term plan for the health service. She defends the Government record and - as per - says having a balanced economy is the answer. She hits out at John McDonnell after he said Labour wanted to "overthrow capitalism". She says that would mean more taxes, more debt, fewer people in jobs and less cash for public services. "We do indeed pay tribute to all those who have worked in the National Health Service over its 70 years. And who work there today. And we want to see a bright future for the NHS, which is why we will be coming forward with a long-term plan for the National Health Service. And what we see today is a national health service with more funding going into it. But crucially with more people being treated, more operations being undertaken. There are people alive today who have suffered from cancer who would not have been alive just eight years ago because our cancer outcomes have improved. That’s the reality of our National Health Service. "But what we also see - what we also see is that this government can only put money into the National Health Service because we have a balanced approach to our economy. And what did we learn this week? That the Labour party and the Shadow Chancellor want to do? They want to overthrow capitalism. What would that mean - it would mean families paying higher taxes." ANALYSIS: That was a pretty by-numbers performance from both Theresa May and Jeremy Corbyn. Surprising the Labour leader didn't touch on the BBC report that some of the Lansley reforms could be repealed... but there you go. The NHS is of course an important issue and a favourite of the Labour leader. But that exchange is unlikely to have moved the dial much. The best bit was probably the PM's attack on John McDonnell. SNP Westminster leader Ian Blackford notes how the immigration regime in the UK is hitting young people who have the right to be here but cannot afford to pay for new visas. He demands fees for young people are scrapped as they have been for the Windrush generation. The PM says a minor who has indefinite leave to remain has access to the same benefits if they need it which renders them ineligible for the fees. Blackford says some young people have to pay up to £10,000 a year to stay and hits out at the Government for policies which "target young people". The PM says she does not recognise the number he mentions. SNP MP Pete Wishart launches a scathing attack on the appointment of new Tory peers to the House of Lords. Bercow steps in as MPs groan in protest. Wishart says the Tories have made sure they have "the right type of crony" in the "circus" down the corridor so they suffer fewer Lords defeats. The PM says the number of peers has actually fallen since she has been in charge - and says maybe Wishart wants a peerage. Tory MP John Whittingdale brings up the case of Natalie Lewis-Hoyle - the daughter of the deputy speaker Lindsay Hoyle - who killed herself due to 'gaslighting' on social media. He wants the PM to raise awareness of the issue. 'Gaslighters' use social media to confuse their victim by twisting facts to lead them to question their perception of events. The PM says it is a big problem and says the Government is always looking at how it can toughen laws. Tory MP Dr Andrew Murrison asks how big data and AI will help transform healthcare outcomes. THAT sounded like a planted question. The PM gets a chance to rehash her speech from Monday about sciences and healthcare. Fellow Deputy Speaker Eleanor Laing put her hand on Lindsay Hoyle’s arm as John Whittingdale asked PM question about daughter’s sad death. Lindsay extremely popular with MPs of all parties. Labour MP Paul Blomfield asks about school funding. He said schools in his area of Sheffield are "at a tipping point" and he asks for better funding for teachers. The PM says the Government is helping schools to bear down on costs where needed. Tory Mark Pawsey asks if the car manufacturing sector will be protected and thrive after Brexit. The PM - surprise, surprise - says it will. Labour MP Jo Platt says NHS staff in her area of Leigh are on strike and asks the PM to wish them well. She wants to know why the PM is allowing "backdoor privatisation". The PM says she already answered questions about the NHS and says the Government is committed to protecting the NHS as Platt shakes her head. Tory Priti Patel asks about stem cell transplants being used to help cure leukemia. She asks if the PM will lead a nation-wide donor registration drive. The PM says the Government has been funding drives to boost BME donors. Labour MP Justin Madders makes a gag about the royal wedding and the FA cup. He says Wembly does not need to be sold off to foreign donors. The PM - in something of an incredulous tone - says the decision is for private firms and has nothing to do with the Government. SNP MP Deidre Brock says is it not true that the PM "doesn't have a clue" how the Northern Ireland 'backstop' idea might work. The PM simply answers: "NO." Lib Dem leader Vince Cable notes that the Tories and Labour back quitting the single market and customs union. He gets a laugh when he urges the PM to put aside party political point scoring and thank Jeremy Corbyn. The PM says nobody knows more about party political point-scoring than then Lib Dems. Tory MP Peter Bone - after thanking John Bercow for calling lots of backbenchers - asks how the EU negotiations are going. The PM suggests they are going well. Labour MP Luciana Berger says the Government plan to help young people with mental health is not good enough. The PM lays out the Government plan and insists the importance of the issue is recognised. The PM says the stigma attached to mental health is removed and seems to pat herself on the back for raising the profile of the issue. Tory MP Luke Graham lashes out at the SNP after it got irked in Scotland about local supermarket produce being labelled 'British'. The PM mocks the SNP. Aaaaand that's it for PMQs for a whole two weeks! Next one on 6 June. Stay tuned for a summary. WHAT JUST HAPPENED AT PMQs? - Theresa May and Jeremy Corbyn clashed over the NHS and privatisation. - The PM hinted that the Government could ban flammable cladding after the Grenfell tragedy, saying ministers were "minded to go further". - She said she would support a new website to raise the issue of 'gaslighting' after the daughter of deputy speaker Lindsay Hoyle killed herself after being in an abusive relationship. That's it for today. Join us for more PMQs live on 6 June after recess.